abapMQ is a custom open source implementation of MQTT 3.1.1, it currently implements all the packages defined in the protocol, and works over websockets and TCP., it works on 750sp01 and up. There is still some work to be done, but the basics are in place, you can now connect your dishwasher(or other IoT devices) to your ABAP instance. “A TCP frame can be of one of the following frame types, which has to be specified using the attribute frame_type in the frame structure (of type APC_TCP_FRAME). Frame type is IF_APC_TCP_FRAME_TYPES=>CO_FRAME_TYPE_TERMINATOR: The TCP frame (message) is terminated by one or several bytes, e.g. line feed (LF) or carriage return line feed (CRLF). The terminator bytes have to be passed as hex code (00-FF) representation, e.g. for LF is this 0A or for CRLF is this 0D0A, to the terminatorattribute of the frame structure. Frame type is IF_APC_TCP_FRAME_TYPES=>CO_FRAME_TYPE_FIXED_LENGTH: The TCP frame (message) has a constant length in bytes. The frame length in bytes has to be passed to the attribute fixed_length of the frame structure (as decimal number). However, in MQTT 3.1.1 the length of the package varies so none of the above can be used directly. To solve this I have set the frame length of all TCP packages to 1 byte, this is very evil, but it works, take care if you choose to use this in a productive environment. Websockets does not have this problem. That’s right. SAP offers a native MQTT Client API as of ABAP Platform 1809. 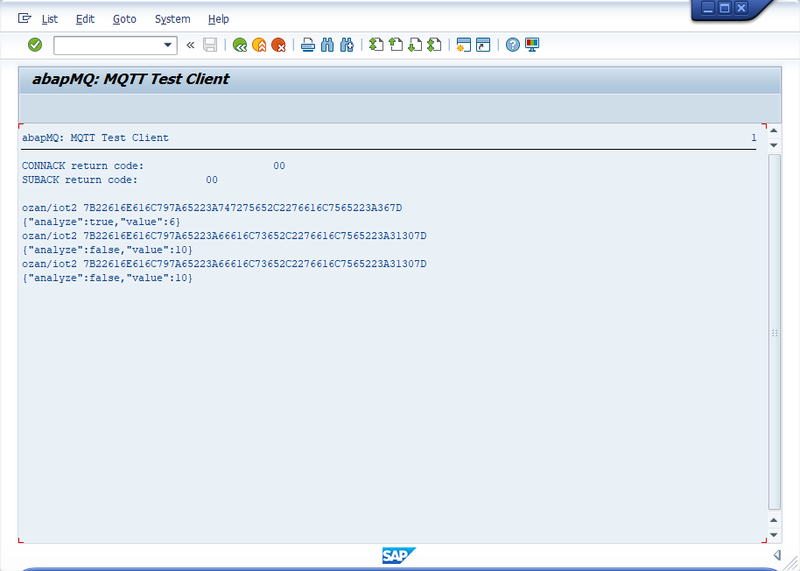 For further information, I recommend the Blog “MQTT client in ABAP Platform 1809“. There you can also find a link to the official documentation and to a tutorial that teaches how to use the provided ABAP API. Btw, a recording of one of the TechEd lectures is also available. Great job as usual Lars!